It was hot in Boulder; over 90 degrees and sunny. However, my friend Christian was in town from Houston and wanted to climb an alpine snow and ice route. I chose the Y couloir on Mount Ypsilon in Rocky Mountain National Park. I've wanted to climb the Y couloir for a long time, but never have managed to do it. We made the approach up to Spectacle Lakes on Friday afternoon. I had to argue with the ranger at the Park headquarters about whether they issued bivi permits for Ypsilon climbs. After a while, she figured out that bivis at Ypsilon were not against Park policy, and we were off to the Lawn Lake trailhead. The trail from the Lawn Lake trailhead to Ypsilon lake was pretty straight forward. After that, it was a little more interesting, with a bit of bushwhacking up the drainage to Spectacle Lakes. The last section of the approach involved following cairns up a steep flowing creek, scrambling up wet rock. 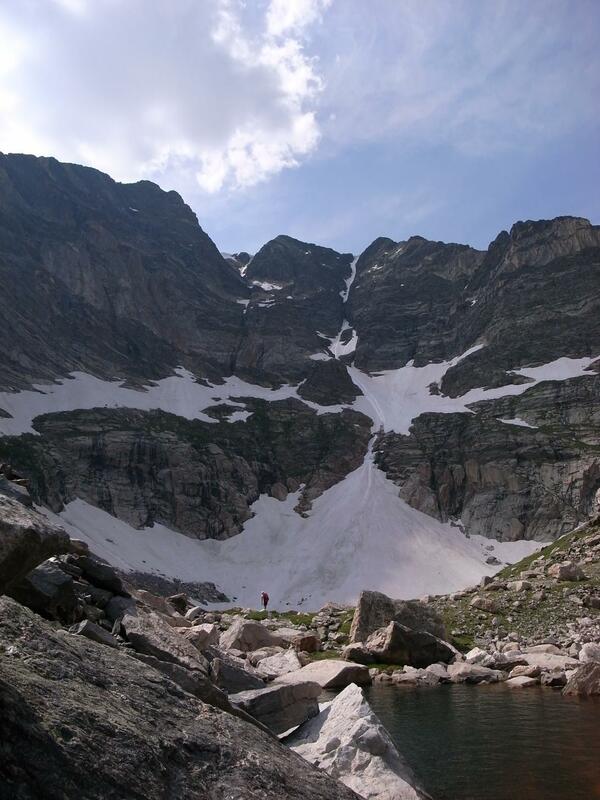 The Spectacle Lakes are in a beautiful location, at the base of the Ypsilon cirque. It's pretty high in elevation, and the terrain is rocky and pretty barren. We didn't see many signs of life other than lots of spiders with empty webs spun in the boulderfields surrounding the lakes. We bivied near the upper lake, enjoying the beautiful mountain scenery, and telling ourselves that the weather was sure to get a bit colder before morning. We were counting on a good freeze to make the route conditions a bit better. We woke up before dawn, and the temperature was a balmy 48 degrees, well above freezing. 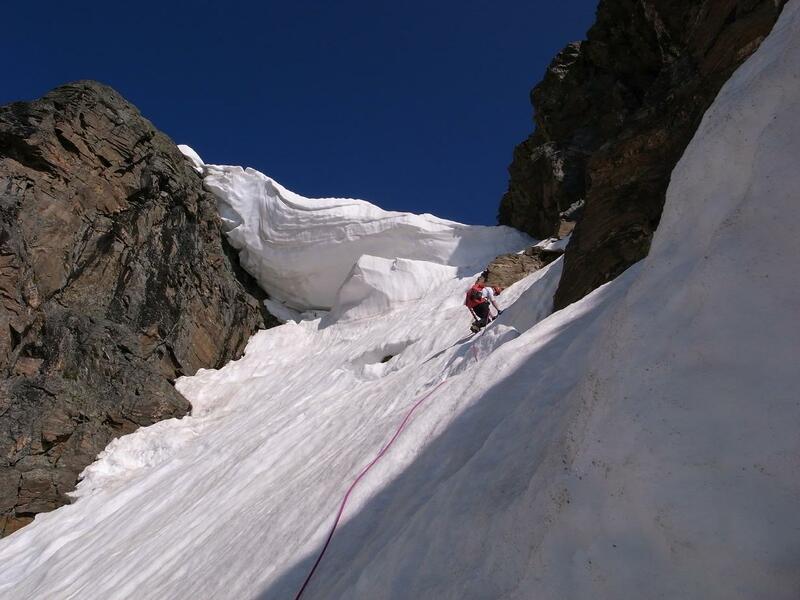 This worried us because the snow would be more mushy and less secure to climb, and also because the couloirs were topped with big, scary cornices, which would become more unstable the warmer they got. We debated for a while about whether we should just cancel the climb and head back. After a reconnaissance of the base of the climb, which revealed good, firm snow, we decided to go for it. Our plan was to climb fast, and hope that the warm temperatures wouldn't bring rocks and cornices down on our heads. 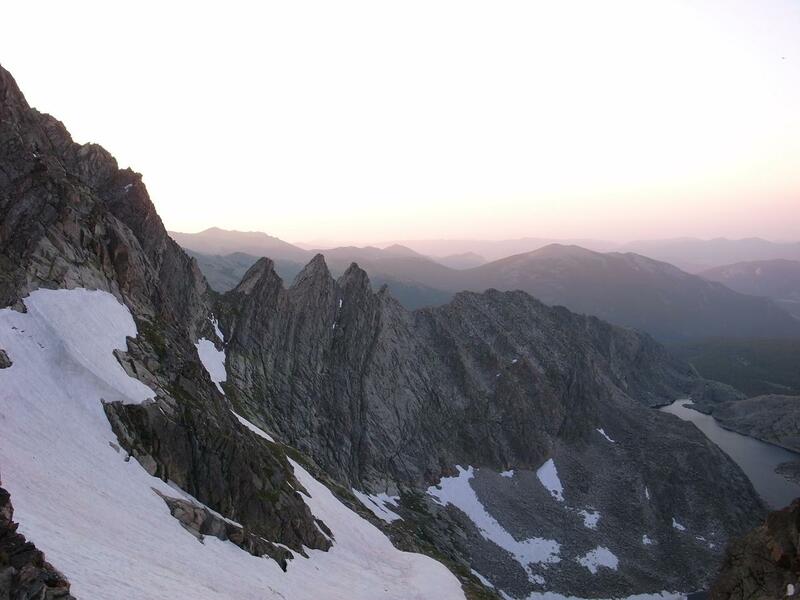 We began climbing at 5:30 and were treated to the beautiful sight of the alpine sunrise. Looking down the face, on our left we could see the profile of Blitzen Ridge, the classic rock climb on Ypsilon. The snow was mostly firm, but there were sections of soft snow, and sections where the snow was wet and mushy. There was a lot of water running on the route, and we could often hear water flowing beneath the snow. When we reached the fork in the Y, we got a good look at the right branch of the couloir. It had a long bare section with a few smears of rotten ice, wet rock, and lots of running water cascading down it. 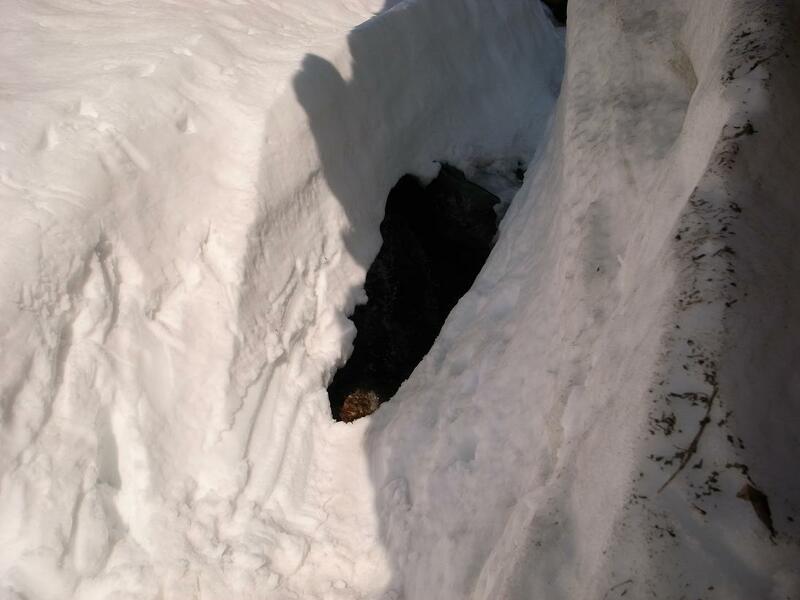 We decided to avoid this and followed the left branch of the couloir where the snow cover appeared more consistent. By and large, the climbing was pretty secure and fun. It was almost all snow climbing, but there were a couple of short mixed/rock sections where the snow had melted out. Christian didn't know what had happened. He heard me yell, and thought I must be falling, but when I didn't come bouncing down the couloir past where he was bracing for impact, he climbed up to see what had happened to me. By that time, I had finally managed to extricate myself from the hole by chimneying back up towards the light. However, I was completely soaked through. I was as wet as if I had gone for a swim in a lake. Luckily, it was pretty warm, and I was able to borrow some dry gloves from Christian, so I didn't freeze. I was pretty freaked out by my experience, and was shaking a lot from leftover fear, adrenaline and cold, wet clothes. Christian stepped up and took the lead for the rest of the route, which was great, because I just wanted to lay down and go to sleep. The remainder of the climb was pretty uneventful. We just worked our way progressively upward, simulclimbing all but 2 short pitches. It would have been more fun if we were not so fully aware of the big cornice, hanging above us like the sword of Damocles waiting to fall and take us out. At 9:30, about 4 hours after we began climbing, we finally pulled over the top of the couloir and out from under the cornices, which, as we passed them, we could see had big cracks near the back of them and really could have fallen pretty much any time. The descent route was pretty sketchy (covered with snow) but we met a couple of hikers who were headed down the walk-up route to Chapin pass, and they very kindly offered to give us a ride back to Lawn Lake trailhead where we had left our car. The hike out to Chapin pass was long and tedious, but we made it out and were home for a shower, food, and late afternoon nap. Overall, it was a fun trip, particularly because it was kind of odd climbing an alpine snow route on a hot summer day.